Are you planning a trip to Canyonlands National Park? During your research, did you see the iconic photo of Mesa Arch framing distant sandstone formations as the rising sun casts an illuminating glow on everything? Did it inspire you to take the same photo? You don’t have to become a photography professional to capture a beautiful Mesa Arch sunrise. We’ll show you how! This is Alan’s favorite Mesa Arch sunrise photo. Keep reading to find mine. Alan and I have fond memories of a wonderful morning photographing this Canyonlands National Park view. Follow our Mesa Arch photo tips to capture an image that will wow friends and family, especially if you’re willing to get up in the wee hours of the morning. The boomer travel adventure begins as you drive U.S. Highway 101 north of Moab for ten miles, then turn left on Utah highway 313 for the 22-mile-drive to the Islands in the Sky entrance of Canyonlands National Park. You’re headed for the parking lot at Mesa Arch, where, just down the trail, many a sunrise has been captured—both famous and not so famous. You won’t be alone photographing sunrise at Mesa Arch. You’ll want to set up well before sunrise to be ready for when the show begins. We visited in the fall. The morning started at about 3:30 a.m. to accommodate the drive to Mesa Arch and the set up process. Because this is a popular photography spot in Canyonlands, arriving early to claim your space at the cliff’s edge is a must. You won’t be the only one clicking the camera shutter. Scope the location out the day before, if you have time. Arriving in the dark to an unfamiliar destination only complicates your morning. Remember, you’re arriving before sunrise so it will be dark—very dark. Bring a flashlight or headlamp to light up the dark walk over the short, unpaved trail to Mesa Arch (.5 miles round trip). Or use the light from your cell phone, but if it’s a cold morning, the battery will wear out quickly. And you don’t want that to happen because taking a few cell phone camera shots, is a good idea, too. I hope you packed a thermos of coffee.You’ll be here for at least two hours photographing the scene. The color changes by the second. Bring the right equipment: Do you need a tripod? Serious photographers will nod their head yes, especially if you intend to capture the iconic shot of the sun’s rays bursting through the arch. But you can still take excellent photos without one. I did. Do you need a professional grade camera? 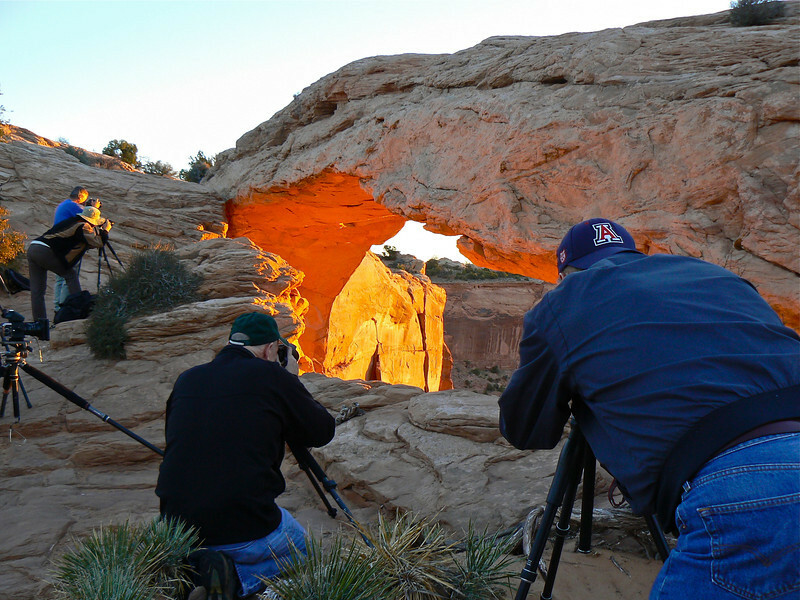 While it’s nice to have one—Alan shoots with a Canon 5D—taking a great Mesa Arch sunrise shot doesn’t require one. I’m proud of the photos that I took using an advanced point and shoot, Panasonic Lumix FZ-1000. And camera phones have become so advanced that you’ll want to use one, too, especially if you like sharing on Instagram or Facebook. 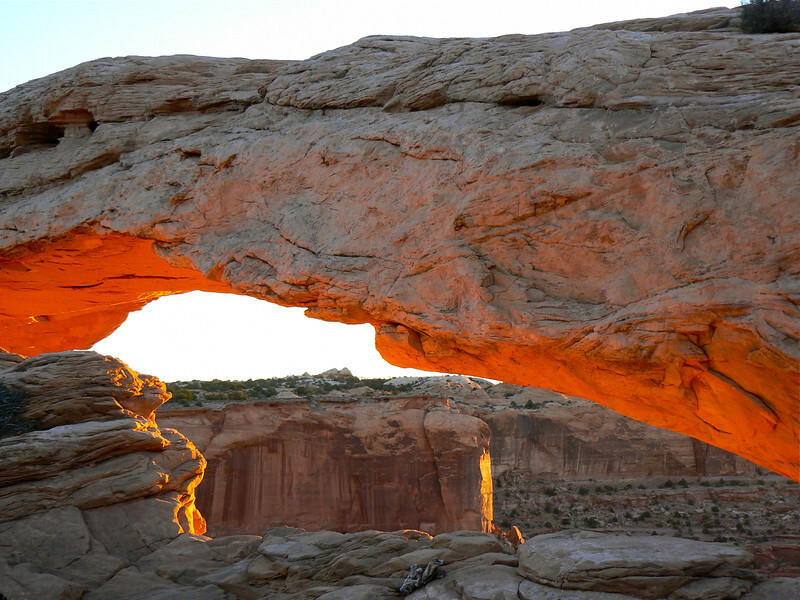 Arrive early: Claiming your spot in front of Mesa Arch isn’t the only reason to arrive early. This also gives you time to think about the photographs that you’d like to take. And it’s always a good idea to check camera settings, knowing what you’ll change during the shoot. Casual photographers, you can do this, too, by learning the program settings on your point and shoot camera. Be respectful: The arch is small so there’s not a lot of room to set up. If other photographers have already claimed the best spots, shoot from the side for a different perspective. During the sunrise, be aware of your surroundings. Don’t step into someone’s shot or fall over the cliff because you weren’t paying attention. And don’t be afraid to strike up a conversation while waiting on the sun to rise—but not during the event! You might learn about other photography spots in Canyonlands and Arches from a friendly photographer. 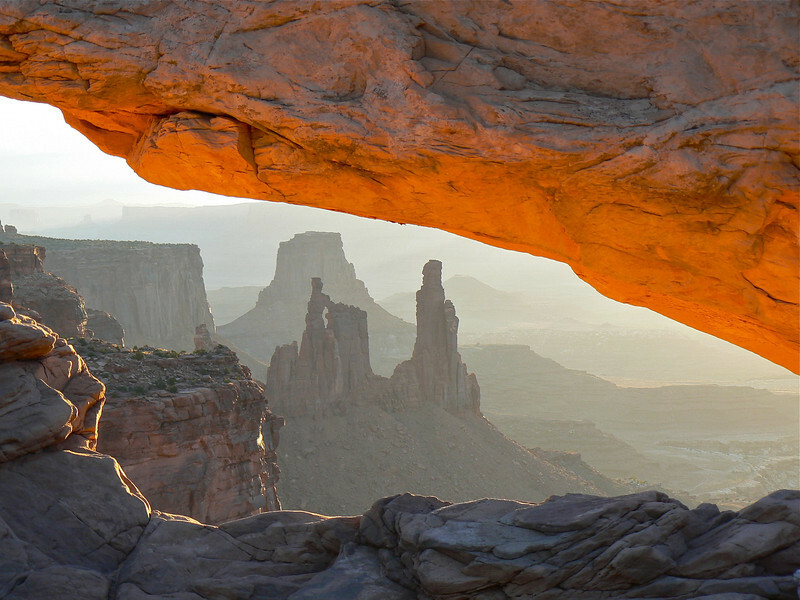 Follow our tips for a do-it-yourself Canyonlands National Park photography tour. Forget the perfect shot: There are so many variables that will affect your photos of Mesa Arch. Did the clouds obscure the sun? Is the crowd of photographers too large to take a centered shot of the arch with the sun shining through it? If you think out of the box, there’s still plenty to photograph. Be creative. Don’t ruin this special morning by expecting perfection. A shot you might not expect. See what I mean about being creative? Look around you: When the sun blasts its orange, and later yellow, glow on Mesa Arch, the rocks, trees and wildflowers in the vicinity light up. By all means, take photos of the arch, but also look behind you and to the side. Is there a plant illuminated against an orange wall? Do you see the golden glow on the rock formation across the way? Take the photo! Put the camera down: Allow for time to simply watch the wonder of the scene that’s unfolding before you. Experiencing sunrise at Mesa Arch is just as important as recording it in a camera. Hang around: One thing Alan and I have learned from photography workshops is that the best light happens after you think the sunrise, or sunset, is done. Don’t leave with the first wave of photographers who think the show is over. It’s not. And now the sunlight has softened to a golden color. Which season is best for taking a Mesa Arch sunrise photo? Spring and summer are good choices for capturing the perfect sunrise photograph due to the angle of the sun. But the arch area will be more crowded. Winter offers an interesting composition if there’s snow on the ground. And, as I mentioned earlier, we visited in the fall and found plenty of great photography opportunities. So basically, visit when you can and work with the conditions that you’re presented with. Should I go to the trouble of seeing a sunrise at Mesa Arch if I’m not a photographer? While taking photos is a fun hobby, it’s not the only reason to see Mesa Arch lit up by the rising sun. Not a photographer? It’s still worth getting up early for the experience of watching this part of Utah wake up to an unforgettable sunrise. This is my version of a Mesa Arch sunrise. Do you like it? Where to stay near Canyonlands National Park? 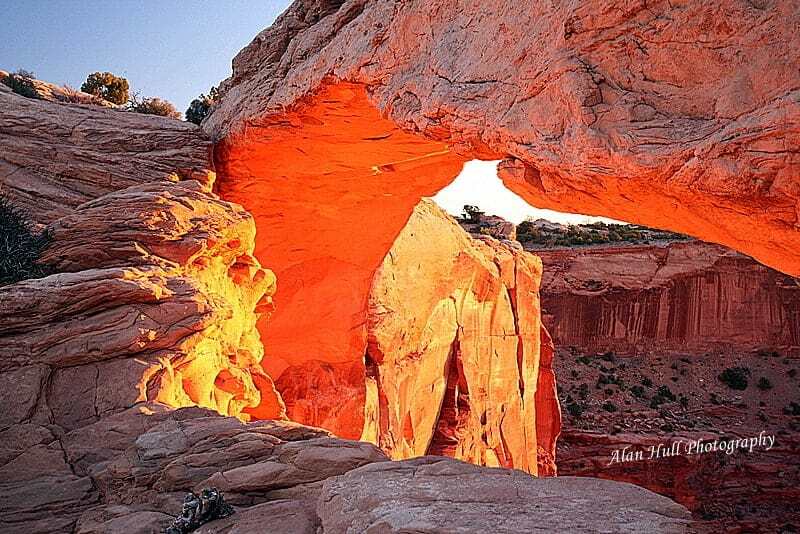 Moab, Utah, makes a central headquarters for visiting both Canyonlands and Arches National Park. You are planning to visit the famous arches, aren’t you? 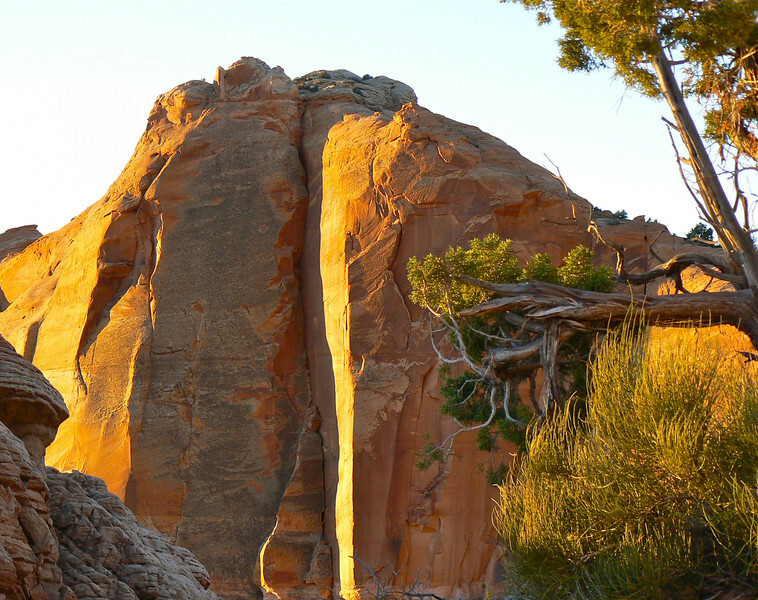 If photographing the parks is your goal, there are plenty of medium range hotels in Moab. You won’t need much else because you’ll be up early taking sunrises, staying out late for the sunsets, and catching a little sleep in the middle of the day. But if you’re looking for a luxury travel experience, consider Sorrel River Ranch Resort. Whether you’re an avid boomer photographer or simply enjoy the beauties of a sunrise, don’t miss this Utah travel experience. You won’t be sorry! 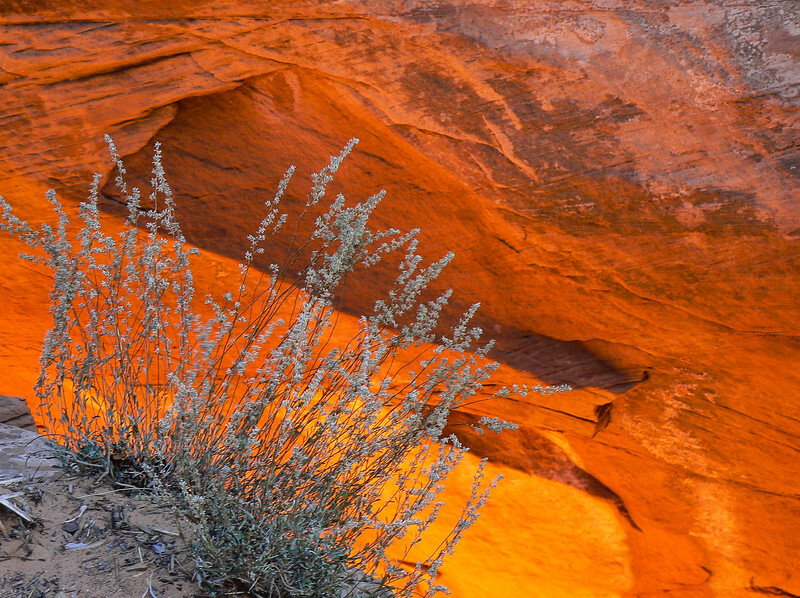 Do you have a favorite Canyonlands photography tip to recommend? Come join the conversation at the My Itchy Travel Feet page on Facebook. Or send us an email with your thoughts.